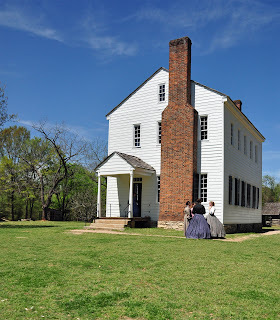 This past weekend, I had a chance to visit Latta Plantation, in Mecklenburg County, near Huntersville. For whatever reasons, it was my first visit to Latta. Latta was built ca.1800 by an Irish immigrant, James Latta. During the Civil War years, the property was owned by the Sample family. The house was preserved in the 1970s, was opened to the public in the mid-1970s, and is now a part of the Latta Plantation Nature Preserve. No, there were no great battles fought on the grounds, nor were there bodies of Confederate generals laid out on the porch. There were several sons of William Sample who joined the 53rd North Carolina Troops. But for the most part, the War passed by Latta Plantation. But what we do have is a pristine historic site in a fantastic location. According to its web site, "In addition to daily tours, Latta offers 35 special events each year, five themed summer day camps, homeschool programs, workshops, educational field trips, and daily tours year-round. The 12,000 school children that visit the site annually are able to participate in unique interactive historical programming, visit rare and endangered breeds of historic livestock, see the process of growing short-staple cotton first hand, visit our honeybee exhibit, and much more!" Despite Latta Plantation's importance in both education and tourism, the Mecklenburg County Commissioners are moving to cut funding to the site. In an area already seriously lacking in historically relevant tourism and educational opportunities, the county wants to cut the one really good site that it has. What's next? Rosedale Plantation? The Mint Museum? The Harvey B. Gantt Center for African-American Arts and Culture? Surly not, you might argue. But remember, history is apparently no longer important. Charlotte and Mecklenburg County are rich in history: from the Hezekiah Alexander House at the almost-defunct Charlotte Museum of History to the Confederate Naval Complex to the World War I Camp Greene. Yet no one, especially the elected leaders in Mecklenburg County, seems to care. The one and only bright spot is the Library Walk, which details a fifteen-stop walking tour connected to the Revolutionary War in downtown Charlotte. No apologies are going to be made for the amount of time that I have spent lately on encouraging you to contact your elected officials and ask them to preserve our history. The funding for Latta Plantation does not need to be cut. Instead, it should be increased. Also, please consider signing this petition here. Folks, we are really being shortchanged reagrding our history here in North Carolina. If you do not stand up and fight for it, who will? In writing about the War in Watauga County, it is my goal to include as many details as possible. In the past couple of weeks, I have "uncovered" several little pieces of stories for which finding more information would be great. Does anyone have any additional information on any of these? The first five of these notes came from a small typed manuscript by Roy Weaver entitled "The Civil War in Watauga County." For sources, all of them are simply family interviews. 1. An old cemetery in the Deep Gap community has the grave of a young man by the last name of Black who was killed by the home guard. 2. In the Aho community a man by the name of Hines was shot by the home guard while begging. 3. In the Bamboo community, a man by the name of Harrison was shot and buried on the top of a high ridge. 5. A man named Price was harassed by the home guard because his sons were not in the army. Price fled to the mountains but was captured when he returned for food. He was placed in the jail in Boone, and the following day, a mob took him out and hanged him (or possibly the sons). 6. A Mr. Council was jailer when Stoneman's Raid occurred. Someone told Mr. Council that the soldiers were coming, but he paid no attention. [A] man who had been mistreated by Mr. Council told Mr.Council that he would give him five minutes to pray. Mr. Council threw up his hands and prayed "God be merciful." Then the man shot and killed Mr. Council. 7. There is a story passed down through his family of a man who died and was buried on the edge of the road in the Beech Creek community. This possibly dates to the War years. 8. Jim Hartley killed Abram Baird (58th NCT) during the War. Coming soon to a North Carolina town near you - me. Ok, so I probably will not make every town this upcoming week, but I will be on the road. Monday, April 8, 2013 - Lt. F. C. Frazier Camp, Sons of Confederate Veterans, High Point - Women's Club, 7:00 pm. Saturday, April 13, 2013 - Latta Plantation, Huntersville, NC - All Day. Sunday, April 14, 2013 - Broadwater Genealogical Society of Cleveland County. 3:00 pm. Neal Senior Center, near Shelby. See this photo? 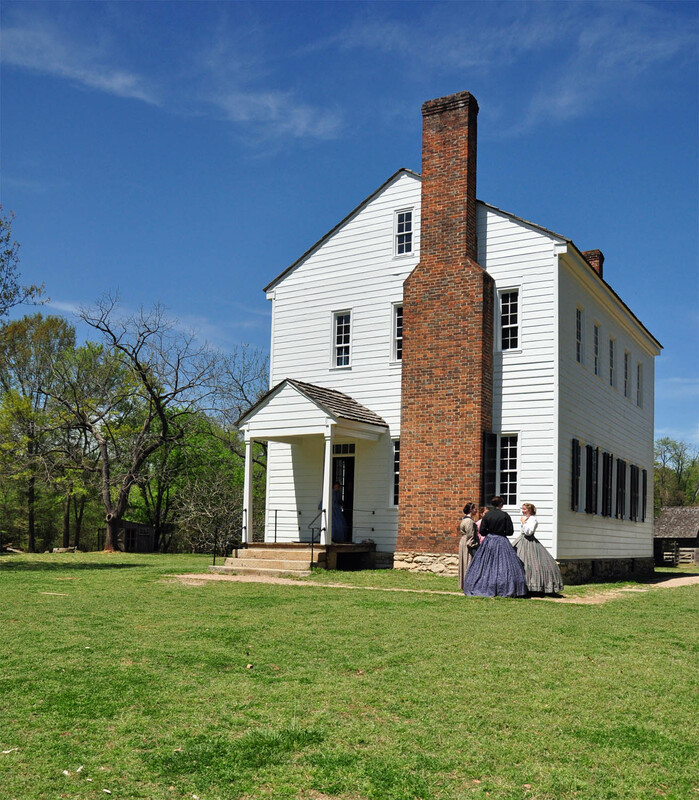 It was taken this morning at the Vance Birthplace near Weaverville. 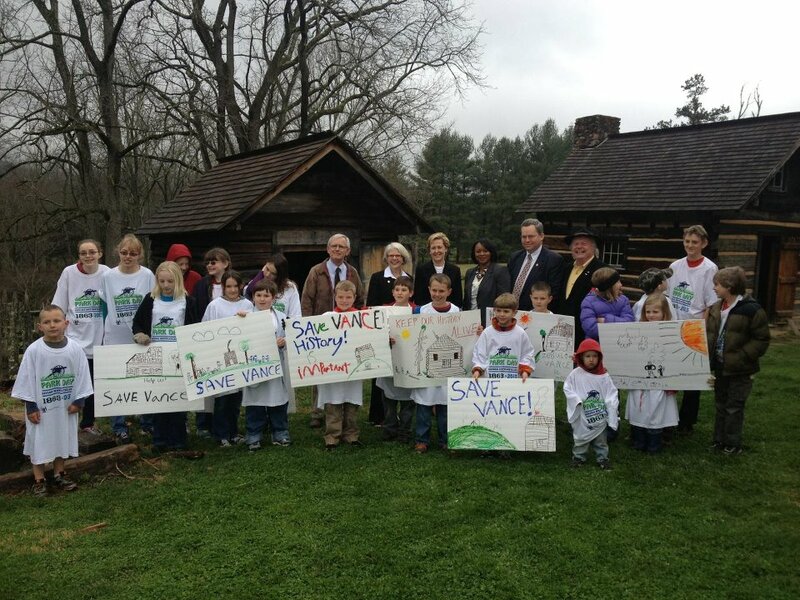 The person who recommended closing this state historic site, Secretary Susan Kluttz, of the North Carolina Department of Cultural Resources, is in the back row, behind all of the Tar heel Junior Historians with the signs asking that the Vance Birthplace be saved. If you have not done so, please contact your General Assembly representatives and ask them to save the Vance Birthplace. And, if you have not done so, please sign this petition here. This photo is from the facebook page of Rep. Nathan Ramsey. This upcoming Saturday, I have the pleasure of being one of the judges in the regional competition for the National History Day. It is an honor, and I am looking forward to seeing what the young people present. However, I am also dismayed. There are by far even fewer students competing this year than last. What has been (I believe) a growing movement away from the importance of studying history seems to have taken some great strides in the wrong direction in the past few weeks. A couple of weeks ago, Governor McCrory released his proposed budget for 2013-2015. In that budget, he advocated the closing of five different historic sites in North Carolina, for a scant savings of just under $500,000, while announcing at the same time a budget surplus of $139 million. Then, this past week, it was announced that a Confederate flag, hanging in the Old Capitol building in Raleigh, was being removed "after complaints from civil rights leaders." The display was part of a re-creation of flags that actually were hung in the Capitol during the War. I'm outraged that it was taken down to placate individuals who did not look at the whole picture of which that was one element - but then, no one really cares when I'm outraged. I regret that I did not make it over to Raleigh to see the display during its short life. And then there is the History Day regional competition. It will not take as much time to judge this year. Why? Few than the usual number of participants. In fact, my son, Nathaniel, who is home schooled, is the only entry from Avery County. There look to be four participants from Mitchell County, none from Yancey, none from Madison. I don't see any from Burke, Buncombe, or Haywood either. It could be one of the private schools from the area has a student or two entered. Maybe it is just that the competition doesn't have the best publicity in this neck of the woods. We know of it primarily because my wife competed when she was a student. And, to further compound my not-so-good attitude so far this week, I went on a research trip last night. The microfilm reader was broken (the only one in the App collection), so I had to just surf the shelves. I found a couple of interesting little bits of information, but it constantly amazes me how little has been written about the history of the area that I call home (western North Carolina). So my thoughts? No wonder we are going to hell in a hand basket so quickly these days. No one has a clue where we came from. And most of them don't even realize that there is a clue to be had.